Random And Some: "It kills me sometimes, how people die"
Last year I discovered and devoured most of Nerdfighter John Green's books. When I scavenged the interweb for similar books, several Internauts recommended Markus Zusak's The Book Thief, so I decided to give it a try. And boy, was it good. The book is told from the perspective of Death and chronicles the life of Liesel Meminger as she grows up in Nazi Germany. There are several male figures in here life (her tenderhearted foster dad Hans, her sage neighbor Rudy, and Jewish fistfighter Max), but here true love are books. Liesel is fascinated by the power of words, and how they affect individuals, and even the whole world. 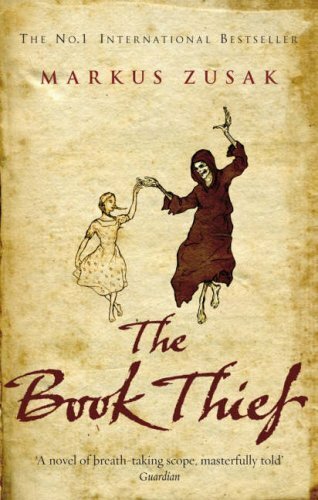 The Book Thief is bitter and sweet at the same time, and Zusak's perfectly-paced and delicately-articulated writing is simply beautiful, even as war and death tighten their grip on Liesel's life.